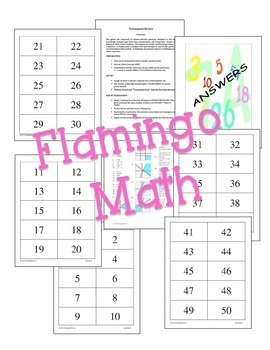 Do your ALGEBRA 2 students need an end of the unit activity for test preparation? Here's a fun and engaging "Tournament" to get students actively involved in practice for a test. You can observe strengths and weaknesses in students' understanding of concepts as you watch them work through the questions. There are many different ways the activity can be used within class to promote cooperative learning. 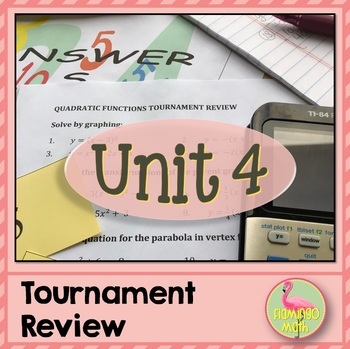 The tournament includes a set of cards, an answer key, and 47 questions related to Quadratic Functions and Equations. The content includes: solving quadratics by graphing, completing the square, factoring, square root method, and quadratic formula. There are questions about transformations, simplifying radical expressions following the order of operations on radicals, rationalizing denominators, complex roots, and systems of quadratic functions. The tournament review activity is a game composed of content-relevant questions designed to test the knowledge students gain from class presentations and homework. Games are played at tables of four students. 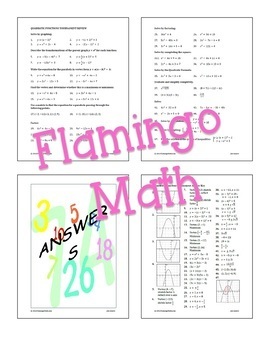 Most games are simply numbered questions on a handout. A student picks a number card and attempts to answer the question corresponding to the number. A challenge rule permits players to challenge each other's answers. 1 Students draw a clock and label the times for 12:00, 3:00, 6:00 and 9:00. 2. Set a timer for 2 minutes. Students move around the room to set a date at each time slot. Students will have four different partners. Remember to leave feedback and you will earn points toward FREE TPT purchases. I love that feedback! Also, follow me to be notified about my new products, sales, updates, and FREEBIES! Thanks for shopping in my store!